Apple has launched a new iTunes feature called iTunes U, a new department in the iTunes Store that provides free education resources from American colleges and universities. The idea is to share resources from these campuses, such as lectures and research, free of charge. 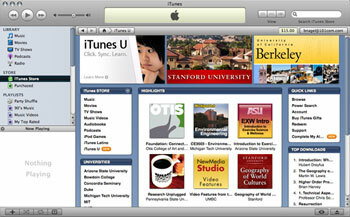 One of the pilot partners in iTunes U that collaborated with Apple to help develop the service is Stanford University. Provost John Etchemendy said, "From its earliest days, Stanford has sought to serve the public by sharing the knowledge generated by our faculty and students. Our partnership with Apple and iTunes U provides a creative and innovative way to engage millions of people with our teaching, learning and research and share the experience of intellectual exploration and discovery that defines our university." As of launch, there are about 200 colleges and universities working with Apple on iTunes U, with 16 currently providing content. These include UC Berkeley, Duke, MIT, Otis College of Art and Design, Arizona State, Michigan Tech, Pennsylvania State, Concordia Seminary, New Jersey Institute of Technology, Texas A&M, Queen's University, UMBC, Bowdoin College, Seattle Pacific, and University of South Florida. Some of the other content available through the service includes course lectures, language lessons, lab demonstrations, sports highlights, and campus tours. "The collaboration began with working with select universities on campus projects [more than] a year ago," Chris Bell, Apple's director of worldwide marketing for iTunes, told Campus Technology. He added that collaboration and development are ongoing. "The platform is new, and we're always looking for expansion." The content can be accessed free through the current version of iTunes within the iTunes Store. Those who would like to get involved with the project can access more information via iTunes or at the Web link below.